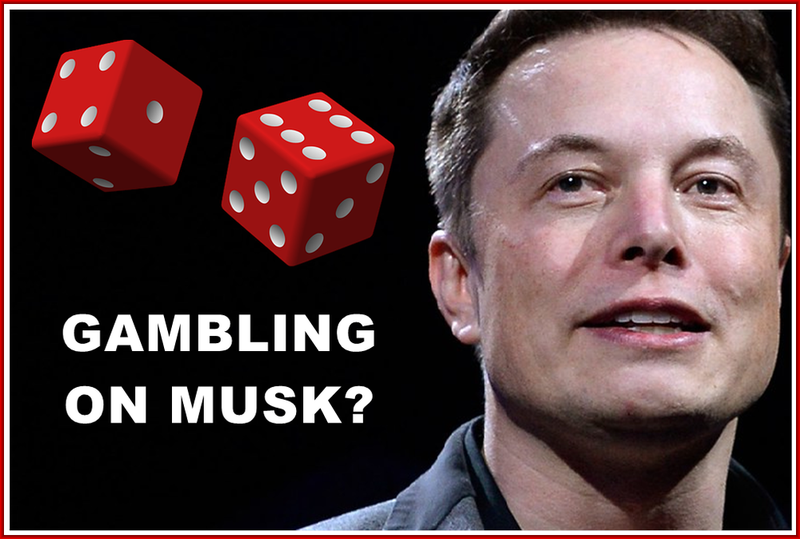 GAMBLING ON ELON MUSK? — AM I NEXT? It is a testament to the personal charisma of Elon Musk, the effectiveness of his graphic arts people and public relations team, and the apparent willingness of investors to highly value a company whose cash burn rates are phenomenal and whose history is one of over-promising and under-delivering. With the only profitable quarter resulting from the sale of emissions credits to other vehicle manufacturers, one might ask what the real value is other than promises of a productive and profitable future? Here is a vehicle company mired in side-deals like Space-X, The Boring Company, Solar City, and various battery production ventures which appear cross-collateralized to some degree. All of which require government tax abatements, grants, contracts, and subsidies to exist. It is almost like all of the Musk-related enterprises have a single customer: the government. As has been mentioned before, there is nothing special about Tesla’s battery technology. And that other vehicle makers who will be entering the market in the near future with massive offerings might pose an existential threat to Tesla’s lower cost vehicles – especially if the step-up their design game and offer a good-looking product. Tesla’s self-driving and feature software are still questionable, and then there is the specter of soul-sucking unionization. Let us not forget that while Tesla is not profitable at present, it does have approximately $2.67 billion in cash-on-hand, and reported $3.4 billion in first-quarter revenue. According to analysts, up to 31% of Tesla’s shares were borrowed by short sellers who hope to profit from underperformance and continued delivery delays. IS ELON MUSK TRAPPED IN A BUBBLE? So while investors gamble on profitability, Tesla's employees are gambling on continued employment. Even though Tesla did fire more hundreds of employees with little or no warning, citing poor performance reviews, there is no guarantee that Tesla will not adjust its headcount to meet Wall Street projections. Perhaps time to execute your side-hustle and reduce living expenses?